Guildford plantation shutters from Just Shutters. 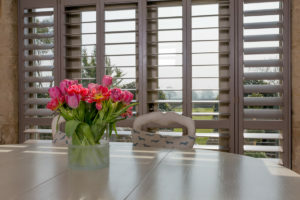 As the premier plantation shutter company in Guildford, Just Shutters offers the finest range of interior shutters in the UK. 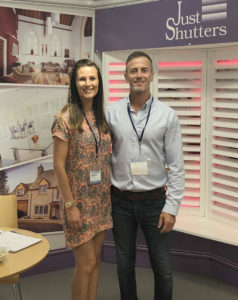 All designed by our shutter experts; husband and wife team Simon and Georgina Broadhurst (pictured right). What’s more, they are installed to our exceptional standard at your convenience. Call us on 01483 339492 for more information. Plantation Shutters also require no maintenance, will enhance your home’s security, privacy, and value. Our shutter specialists are experts in the field, from initial contact through to installation, we’ll talk you through your options and listen to your needs. You can see some of our recent installations on our Plantation Shutters Photos page. Furthermore, we stock the largest range of plantation shutters in the UK. This includes our own exclusive ranges that you will not find anywhere else! Click here to browse our extensive range. Contact us today for Plantation Shutters in Guildford: 01483 339492. We could tell you just how wonderful our company is, but we thought you’d rather see what our real customers say about us and let our customers speak for themselves. With over 1700 reviews and a score of 9.9/10 we pride ourselves on our excellent service – we are working on the 0.1! All testimonials taken from independent review site checkatrade.